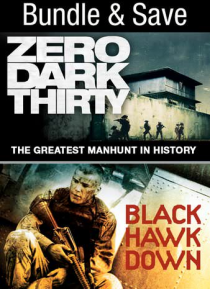 Action-packed war adventures featuring ZERO DARK THIRTY, a chronicle of the decade-long hunt for al-Qaeda terrorist leader Osama bin Laden after the 9/11 attacks, and his death at the hands of the Navy SEAL Team 6 in May, 2011. Also featured is BLACK HAWK DOWN where 123 elite U.S. soldiers drop into Somalia to capture two top lieutenants of a renegade warlord and find themselves in a desperate bat… tle with a large force of heavily-armed Somalis. INCLUDES 4 BONUS FEATURES FOR ZERO DARK THIRTY.